Discussion in 'General Discussion' started by Mick West, Jun 22, 2014. 1. It's not a cure for a AIDS. It's just a patent for some speculative use of colloidal sliver to zap the HIV virus which has never been shown to work. Patents don't mean something works. There are patents for teleportation devices, and space warping interstellar spaceships. 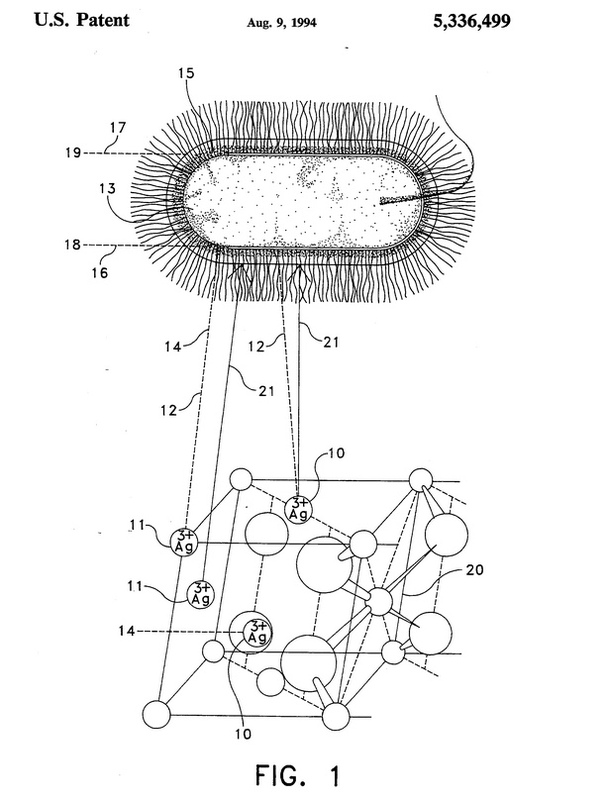 In this case we've got a patent owned by Marvin S. Antelman, and is basically saying "use the thing I patented in 1992", which is a rather bizarre idea where crystals zap bacteria and viruses by what amounts to little more than wishful thinking. There are no studies investigating if it works, and the the suggested explanation involves just drawing some lines between a molecule and a bacterium. Antleman sells his "cures" on his web site, so it's not like the "cure" is unavailable, there is just no evidence that it works. It basically appears to be ordinary quackery. His web site does have a link to "Scientific Proof Colloidal Silver Kills", but if you click on it you get a "Page not Found" error. And there are many "cures" for cancer, including one by Antelman. The present invention relates to a pharmaceutical composition comprising snake powder that is derived from the Tzabcan “Crotalus durissus” rattlesnake. The snake powder is prepared by continuously baking the body of the rattlesnake until it completely dehydrates. Then, the dehydrated body is pulverized into a fine granular powder. The present invention included an in vitro method of inhibiting cancer cell growth utilizing the snake powder exhibited. Accordingly, the snake powder can be applied for the development of drugs which are effective for the treatment of various types of cancers. Again, patents don't mean the thing that is patented works. The only thing a patent means is that someone is trying, one way or another, to make money from an idea. I bumped into this one on Facebook, someone posted a meme to 'google 5676977' so I did. 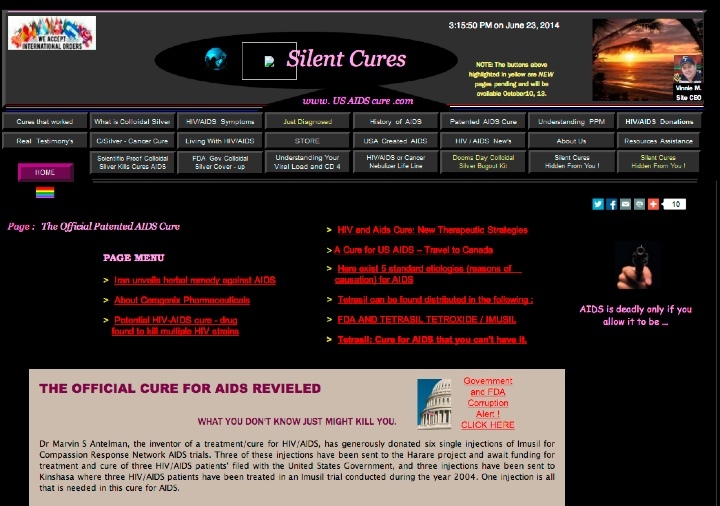 And lo and behold, the first link is to a .gov website talking about a cure for AIDS. I haven't the technical knowledge to debunk the patent itself as being legitimately useful, but instincts alone told me patent = not significant reason to believe there is a cure. There have been many discussions here on patents and how just because something is patented, doesn't mean it's even a real thing or currently practical. Not much research has been done, but studies done on the compound so far suggest silver oxide may be good for wounds and ulcers.Silver oxide nanoparticles have antimicrobial properties in vitro but are toxic. One page hosted by extremely paranoid conspiracy site Rex Research promotes Tetrasil as a cancer treatment and lists many patents held by a Tetrasil company, though if there's a patent for it, that doesn't necessarily mean it's good. @Mick West /mods, perhaps you could edit the JREF link into the OP? It won't let me edit the post. Might as well change the title to 'debunked' as well. Thanks folks. There exist patents regarding the transportation of spacecraft to Mars, and patents addressing the colonization of Mars but that is not to say that the government are sending astronauts to Mars right now. A patent is a patent - conspiracy theorists however misinterpret their worth and view them as the holy grail of whatever conspiracy they are willing to submit. They are practically synonymous to a certain group of people who dub aluminium quantification in soil as evidence for chemtrails (when in reality, aluminium is a very common element, composing 7% of the dry weight of soil - nothing abnormal; it's been that way before there were aircraft). In conclusion, this is concerning mis-interpretation. AIDs-related illness costs the government millions (>£750,000 in the UK alone) annually - it would make no sense to postpone a proven treatment. Myles Power just posted a link about this on reddit in the /r/skeptic section, they brought up a good point in the comments. I googled the number 5676977. Low and behold the patent popped up. Why do those applying for the patent choose to word the Abstract as if they found the cure by using diamagnetic semiconducting molecular crystal tetrasilver tetroxide(Ag.sub.4 O.sub.4). Are patents typically written like this because the language in the abstract for the layman implies that they indeed found a cure? I understand this isn't a cure, I'm just trying to understand why language like this is chosen upon applying for patents. I understand this isn't a cure, I'm just trying to understand why language like this is chosen upon applying for patents. The person who wrote that is claiming they have a cure. So what comes first the trials or the patents for medically related patents. I'm not sure what you are asking there. This is a patent for what a person claims to be a cure for AIDS. Medical trial are an entirely separate issue. Have you read this thread about what patents actually mean (nothing)? Patents don't mean something works. There are patents for teleportation devices, and space warping interstellar spaceships. And the ".gov" at the end of the address does not mean "the government" has anything. That's just the patent office. 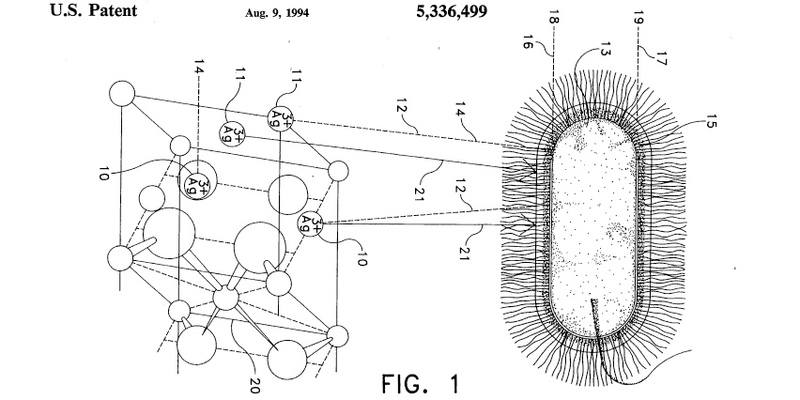 The actual patent is owned by Marvin S. Antelman, and is basically saying "use the thing I patented in 1992", which is a rather bizarre idea where crystals zap viruses by what amounts to little more than wishful thinking. Antleman appears to sells his cure on his web site, so it's not like the "cure" is unavailable, there is just no evidence that it works. It basically appears to be ordinary quackery. I read that, and understand they mean nothing. My contention isn't with the claim, its with how the patent is written. To a layman, and this is possibly why these patents circulate to a certain extent in the CT world, are written as if a cure was in fact discovered. The abstract leads one (layman) to believe that this silver oxide can cure HIV. I know anyone can file a patent, and a large percentage of them are bogus or unworkable, but I was trying to allude to the reason why these patents possibly get as much momentum as they do.. The abstract leads one (layman) to believe that this silver oxide can cure HIV. So? That's what the patent is about, claiming that it cures HIV/AIDS. It does not mean it has actually been show to do so, or that any of the claims made are real. To a layman, and this is possibly why these patents circulate to a certain extent in the CT world, are written as if a cure was in fact discovered. The abstract leads one (layman) to believe that this silver oxide can cure HIV. Well it essentially an advertisement for their invention, so they would 'sell' it. It's not a scientific evaluation. I totally agree and I think (believe) these patents are written with that in mind. A sales pitch is the priority since these patents are open to the public for review, and then it is interlaced with scientific vernacular and or mathematics to make it seem more credible. I think those who read these patents and believe they are authentic and workable don't understand that aspect of it. "I just zapped myself into a smurf but I am finally cured of aids." You can't really be serious in thinking that you have debunked anything here. AIDS is man-made, Henry Kissinger gave and signed the order to create it. This is just a tool, not a cure. Your natural immune system is the cure, if anything. This is just a tool to give to the body to use against the retro-virus. So if anything, you trolled here, to tell people that it's not a "cure". Well you've been trolled hard, congratulations. TROLLED BY ME Then I see that you went for it. You are talking about NSSM 200? To answer my own question. NSSM 200 is used in these claims afaik...and there is nothing in there greenlighting AIDS by Kissinger to decimate world population. It's a depressing read though. As we all know sickness, cancer, AIDS - these are extremely profitable illnesses and therefore the greedy banksters and American medical association will never release any cures for anything. They make millions on treatment. The banksters own the big pharma corps who make all the drugs. Healing and useful remedies are strictly off limits. What evidence do have that there are cures for AIDS or cancer that are not being released because of greed? Further to above, are there any evidence available showing any cure ever being withheld due to financial gain? Imagine if another company released the cure. Imagine how much money you would make with a cure. Sure, a few pills or an injection would be relatively cheap compared to a continues treatment, but there are 14.000.000 new cases per year, which is expected to rise to over 23.000.000 new cases per yer in two decades. The number of new cases is expected to rise by about 70% over the next two decades. A patent normally exist for 20 years. Which means that the medical company who invented and patented the cure will have exclusivity for 20 years. That is at least 280.000.000 potential customers (14.000.000 x 20 years). I say potential customers, but who would option to not buy the cure? Furthermore, as mentioned before, the number is expected to rise. This is purely speculative, but let's imagine a simple cure which would consist of either a few pills, injections or a combination. I imagine it would not be just one visit at the doctor, let's for arguments sake say it would take 5 treatments spread over a year. Each treatment would use the drugs priced at 100 USD. That is 500 USD per cancer patient. According to Fierce Pharma the top cancer drug earned 3.000.000.000 USD in 2011, which is half of the above-mentioned example. I know the above example contains some rough estimates, but my point is that I can't imagine anybody in the pharmaceutical industry believing it would be profitable to not sell a cancer cure. They would risk somebody else developing a cure and taking all their earnings (both from treatment and cure) away from them. Anyone who thinks treatment is more profitable than cure has never had to pay for a non-routine prescription while it's still under patent. I needed some specialty drug after I got poisoned by some invertebrate that got into my aquarium on a rock, and I had to pay monthly on that single dose for two years. Some googling shows that the above mentioned Rituaxan can run $13,000 per infusion and is administered over a period of up to six months. One patient provides hundreds of thousands to millions of dollars in revenue for the drug company. If they did not have the drug, they'd make about zero dollars for the pharmaceutical companies. Sure, they'd spend the remainder of their life loaded up on pain pills and regular prescriptions to manage symptoms, but even a top shelf pharmacopoeia of those drugs is not $13,000. The stay in the hospital might hit that much, but it will be paid either way, and doesn't go to the pharmaceutical companies, it goes to the hospital, many of which are backed by charity or municipal bond and do not operate at profit from services alone. And when a drug is coming off of patent, there's a lot of tricks to get it back on patent. The most common one is to package it with another drug that's commonly given alongside it and deliver both in a single dose. New patent, new 20 years of exclusivity, and you've got an army of salespeople out there giving doctors free lunches and office supplies so they exclusively prescribe it. So in a few years when Rituaxan's patent expires, they might just mix in something to counteract the drop in blood pressure or nausea, up the price to $14,000, and buy themselves another 20 years as the top chemo drug on the market. And even if it does expire and your sales slip as generics come on the market, pharmaceutical companies don't care that much. Because you've still got that army of salespeople giving out free stuff to doctors and stretching the boundaries of advertising law by spreading doubt in the generics' efficacy. And, worse comes to worse, the markup on these major revenue drugs is on the order of 500,000% anyway. I believe if this guy actually read the patent, then he couldn't possibly state the points he laid out, that "1. It's not a cure for a AIDS. It's just a patent for some speculative use of colloidal sliver to zap the HIV virus which has never been shown to work. 2. The government does not own the patent. It's owned by alternative medicine salesman Marvin S. Antelman"
"Method of curing AIDS with tetrasilver tetroxide molecular crystal devices"
that doesnt say the speculative use of colloidal silver to zap hiv.. how deluted do you have to be, to not read the patent, or its title even and to just make stuff up? .. and the details of patent actually tell of human trials that worked, so unlike someone else's inane analogy, of technology that hypothetically travels to mars, the patent itself states the times the cure has worked and not just to zap HIV but how it cured full blown aids as long as the person wasnt too far gone from the damage to their body.. its in the patent, literally because of course, you dont patent a cure for something if you dont know it works lol and the patent itself is actually attached to a chain of patents that starts all the way back in 1983 and the assignee of the patent is the secretary of the army and this followed by several patents by others, before it was continued on by atnleman... so tell me, how can you debunk something if you havnt even read the title let alone the patent? dont mislead people please because you are afraid of reality or you lack a functioning intellect. 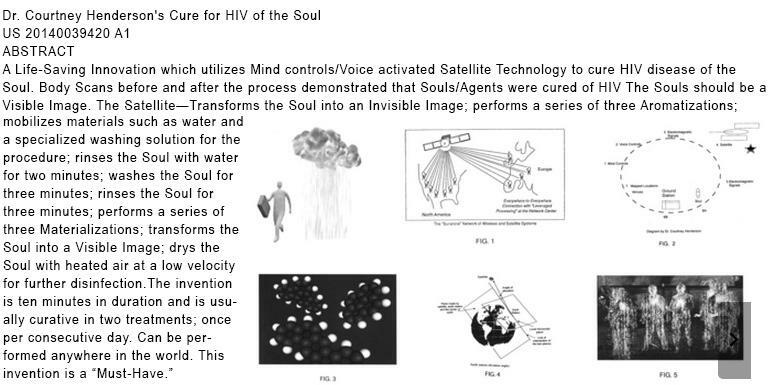 How is that different from this patent, which claims to be a "life-saving innovation which utilizes Mind controls/Voice activated Satellite Technology to cure HIV disease of the Soul"? Both are claims. Both are totally unproven. .. and the details of patent actually tell of human trials that worked, so unlike someone else's inane analogy, of technology that hypothetically travels to mars, the patent itself states the times the cure has worked and not just to zap HIV but how it cured full blown aids as long as the person wasnt too far gone from the damage to their body.. Meaningless, both due to the incredibly small sample size and the lack of control. The patent also quotes US Patent 5,336,499, which does not mention human trials, only in vitro tests. like the patent to cure HIV of the Soul? lol indeed. and the patent itself is actually attached to a chain of patents that starts all the way back in 1983 and the assignee of the patent is the secretary of the army and this followed by several patents by others, before it was continued on by atnleman... so tell me, how can you debunk something if you havnt even read the title let alone the patent? dont mislead people please because you are afraid of reality or you lack a functioning intellect. You seem not to understand how patent citations work. See the asterisks? That means the citation was added by the patent EXAMINER (not the applicant) because it is a related patent. The silver salt is really just a delivery method: many organic molecules are given as metal salts, to make them more soluble and active. It's the metachloridine that is the active ingredient. By contrast, tetrasil is just an inorganic silver oxide, Ag4O4, with no organic antibiotic agent. And finally and most importantly, nobody is suppressing sales of tetrasil. You can buy it as pool disinfectant, among other uses. It's a long time since my chemistry degree, but this idea of "nano electrocution" sounds very specious. The idea seems to be that electrons will pass from an Ag(I) atom to an Ag(III) atom in the crystal lattice, via the cell wall of the virus. I've had a quick look through the literature and the only papers that reference this idea are by Antelman himself or other patents that mention them. To say it's a fringe idea would seem to be putting it kindly. A more recent paper is here. It still quotes the Antelman patent, suggesting that this is the only tetrasil (or "silver oxide hydrosol", as it is called here) study with AIDS patients in vivo. This 2012 paper is a "research proposal", proposing further study. Its very existence is pretty good evidence that nothing is being covered-up or suppressed when it comes to studying silver compounds to treat HIV. The test results claimed in the patent are for an incredibly small group (I can only imagine the outcry if a pharmaceutical company tried to push a medicine to market based on such a test), don't meet the criteria for a medical test, and don't appear to have been subject to proper publication and/or peer review. I've been unable to trace any further information on the tests, but did find the following from the "Compassion Response Network", to whom Antelman donated 6 courses of his "cure" in 2003/4. Results are given for two of three test subjects (the third subject was rejected), but whether they actually carried out tests with the remaining 4 courses doesn't seem to be documented. Again, like Antelman's results, this is a very small and uncontrolled test group, but does include much more thorough information on the method and results..
Dr Marvin S Antelman, the inventor of a treatment for HIV/AIDS, has generously donated six single injections of Imusil for Compassion Response Network AIDS trials. Three of these injections have been sent to the Harare project and await funding for treatment of three HIV/AIDS patients, and three injections have been sent to Kinshasa where three HIV/AIDS patients have been treated in an Imusil trial conducted during the year 2004. One	injection is all that is needed. Compassion Response Network decided in September 2003, to conduct a trial in Kinshasa of Imusil treatment on three advanced HIV/AIDS patients, with comprehensive blood testing and medical checks extending over six months after the treatment was provided. For each patient, the treatment consisted of a single injection of Imusil. This is unusual, because most other treatments for HIV/AIDS rely upon daily or regular treatment. Of the three patients selected, one was rejected from the trial because the bDNA blood test did not indicate HIV infection. We have a third sample of Imusil still in Kinshasa, that we will use for trialling a third patient on Imusil some time in the future, when funds permit us to continue. 2) CD4 immunity cell count remained for both patients under 200, a seriously low level of immunity causing constant risk from secondary infections. The bDNA and CD4 results appear roughly the same as would have been expected if no treatment had been given. After four months the doctors expressed concern for the continued health of the patients. In the first four months following receiving the injection, both patients had a period of very positive improvement in the medical checkup.Both patients showed increased vitality and a sense of returned health, while skin complexion and candidiasis cleared, and other physical symptoms of AIDS improved. After four months however, both patients relapsed to their Pre-Imusil treatment condition of AIDS. At around four months both developed fevers. At around seven months, patient A went into a coma for nearly a fortnight, before we was revived. 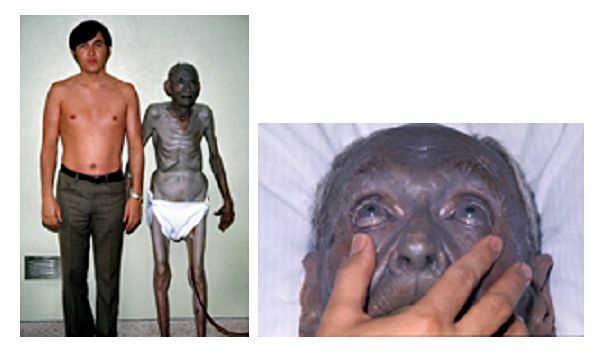 He remained however very weak and bed-ridden and died in March 2005, ten months after receiving the Imusil injection. With patient B, although after four months most of the AIDS symptoms have returned, his health is yet not too serious. We will continue to support him, and will offer to him an opportunity to participate in the second trial of alternative treatments to be held in Kinshasa. Overall, the effect of the Imusil injection seemed to have been very positive over the first four months, but the positive effect seems not to have been long-lasting. Let it just be that this current day they are recruiting to build a colony on mars..
For a Mars One mission in 2025. Or a SpaceX mission in 2026. Or a NASA mission in 2035. They are probably getting closer to curing AIDS also.